Fee: $5 per game. There will be three games, but you are not required to play all three. Although this tournament is capping off our summer league, all are invited to play. First round pairings will be narrative, second round pairings will be challenges, and third round pairings will be random. The entirety of the entry fees go to in-store prize support.Playing games gives you chances in the prize drawing. In addition, there will be a 50/50 raffle during the event going to the terrain fund. This is a very relaxed schedule. If we have people finishing early, we will go ahead and start the next round early. 12:00pm-1:00pm Lunch - Bring some cash and we'll order a pizza. Otherwise, lists must be Battleforged and have no other restrictions. The most recent version of a unit must be used regardless of Battlefield Role. Forge World and Horus Heresy are allowed. Players of the Summer League are encouraged to use those models for this event. If you use the same models from the League, then the games in this event will count as League games! All models should be a 3-color minimum and minimum based for this tournament.Please see the painting and sportsmanship scoring sections for details. Any counts-as units must present a good effort to reduce confusion for your opponents. 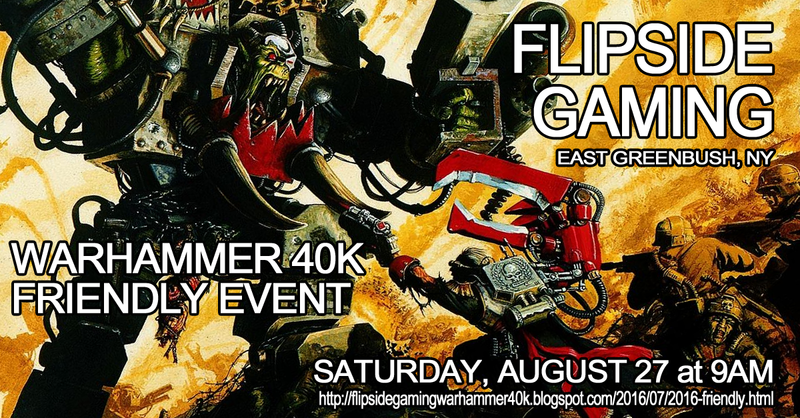 Counts-as must be provided to the Tournament Organizer (adam.fasoldt@gmail.com) before the event if you want to avoid your model not being allowed on game day. This is especially true for Forge World or Horus Heresy models. Make sure they are the legitimate models or the alternative models are very convincing. If we begin to see nothing but poorly built armies simply to take advantage of good rules, restrictions against these units will likely creep back into our events. Insistence upon using bad reproductions will reduce your Sportsmanship score to zero. We will be using the standard Maelstrom missions for this event with alternative secondary missions. These alternative secondary missions will be posted soon. A copy of the scoring packet. Death From the Skies: Players who purchased the Death From the Skies book are welcome to use the Units, Formations, Wing Commanders, and Attack Patterns from this book. All other rules are banned as per the ITC FAQ. Any rules within the Units, Formations, Wing Commanders, and Attack Patterns which refer to other banned rules (such as Air Superiority and Dogfighting) are ignored for the purposes of this event. Shifting Worldscape: This power is allowed to be used at this event. However, when moving a piece of terrain, it must move in a straight line, it may not pass over other models or terrain, and it may not pivot to a different angle before arriving at its final destination. Terrain will be static and placed by the judges. If both players agree, however, some terrain may be moved. These are arranged from largest prize to smallest prize. You must play all 3 games to be eligible for the first three prizes. Best Overall: The player's combined Sportsmanship and Appearance scores. Best Appearance: The player with the best appearance score wins this prize. Best Sportsmanship: The player with the best sportsmanship score wins this prize. Random Drawings: Additional random drawings will be added based on turnout. 3-Color Minimum: This includes 2 major colors and a minor color. The primer doesn't count as a color. If you were to spray a space marine brown, paint the guns silver, wash the model with black, and glue sand to the base, this would be considered 3-color minimum acceptable. Tabletop Standard: This would include all details color-blocked before washing, and a single highlight on top of the other requirements for a 3-color minimum. Judges are encouraged to score between the numbers presented for the General appearance score based on any partial accomplishment towards a particular goal. For example, if a large number or a vast majority of models are painted beyond a tabletop standard, but some are not, then they may wish to score 9 or 10 points. What constitutes "a vast majority", "a large number", or "a handful" of models is up to the Judge's discretion. Also note that the examples given next to a points score is just that... an example. Other factors can be involved in a points score. Suffice to say, Appearance Scoring is extremely subjective. +0-3pts Judge's discretion. This is mainly to differentiate execution between players with nearly maximum points, but could also be used to award good faith on the part of players who are trying very hard to paint their army. Judges are also encouraged to take into account difficulty level and model count, to some extent, for the awarding of Judge's Discretion points, though the award is entirely up to them and players are asked not to grill the Judge on their final decision. If the Judge feels threatened or put off by questions by the players, the Judge is encouraged to alert the Tournament Organizer so that penalties may be incurred on the player's sportsmanship score. Asking for advice on how to improve one's painting, however, is highly encouraged. At the end of the tournament, each player will offer a vote for Favorite Opponent and a Second-Favorite Opponent. Each Favorite Opponent vote is worth 5 points and each Second Favorite Opponent vote is worth 3 points. Each player also receives 5 points if no complaints are lodged against them throughout the tournament. Players who do not bring a 3-color minimum painted and minimum based army will not receive the bonus 5 points for sportsmanship.